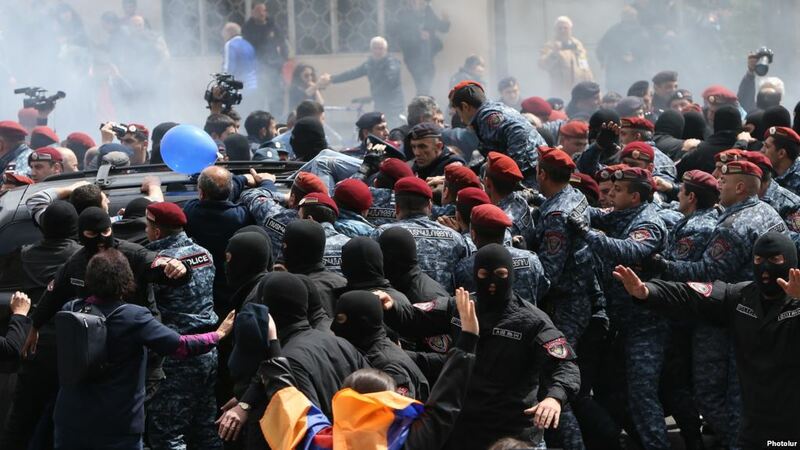 In the last 10 days, thousands of citizens marched in the Armenian capital of Yerevan and in other regions to protest the actions of former President Serj Sargsyan, who after finishing his second and final term in office earlier this month, is now Prime Minister. Following a 2015 constitutional referendum the country shifted from a presidential system to a parliamentary republic - relegating the presidency to a more ceremonial role. After rising to power in early 2008 through rigged elections and violence, Former president Sargsyan won a second term in early 2013 through falsified elections. During his tenure, President Sargsyan initiated changes to the Armenian constitution to transfer the country’s governance structure into a new parliamentary system and establish power of one political party in the parliament. After today’s brief meeting with Serj Sargsyan, Nikol Pashinyan, the leader of the opposition party, and the thousands of demonstrators gathered in the Republic Square marched to Yerevan’s Erebuni district. Civil disobedience throughout the period was not violent. On April 16 demonstrators tried to block Baghramyan Avenue, where the office of Prime Minister the Parliament are located, and continued their peaceful protests, a clash broke out between police and peaceful demonstrators, as a result of which the police used special means against demonstrators. As a result, there were 46 wounded, including 40 peaceful demonstrators. mostly youngsters. Today, on April 22, the police used the special means again. Many demonstrators were injured. Once Pashinyan was detained, riot police used stun grenades against the crowd and began mass beatings and detentions. Demonstrators are gathering in the Republic Square, where police have already concentrated forces and are pushing protesters away from the area. Other protester groups are blocking street across Yerevan. thousands are marching across Yerevan and the regions of Armenia; traffic in many parts of the capital is paralyzed. A lot of villagers are blocking highways leading to the capital. Despite police states that the rallies are illegal and urged them to immediately leave the area and threat to use special measures, peaceful demonstrators continue the non-violent actions. Masked officers of the police special forces are flooding the square. The marches are being overseen by a small number of mainly civilian-clad police officers. More than 200 demonstrators have already been detained. ​We, the representatives of “Women in Black”, Armenia PeaceBuilding Initiative, express our deep concerns to the violence committed by the Armenian Police against civilians and protesters. Following a 2015 constitutional referendum the country shifted from a presidential system to a parliamentary republic - relegating the presidency to a more ceremonial role. ​It’s already 6th day that thousands of people gather in Yerevan’s France Square to express their rejection against the election of former Armenian president Serzh Sargsyan as the country’s next prime minister. On the morning of April 16, protesters launched a civilian disobedience action plan, which supposes to block bridges connecting the outskirts of Yerevan to the center, strike and strike. Thousands of students, self-organized, and went out to the streets to express their protest. Civil disobedience throughout the period was not violent. At a time when demonstrators blocked Baghramyan Avenue and continued their peaceful protests, a clash broke out between police and peaceful demonstrators, as a result of which the police used special means against demonstrators. As a result, there were 46 wounded, including 40 peaceful demonstrators. mostly youngsters. On April 17, protesters continued civil disobedience. At 8:15 am, when the demonstrators started gathering, police began mass arrests. The first was arrested dozens of students who were discussing their protest actions for the day. The latter were illegally kept in the police station and were not allowed to go. 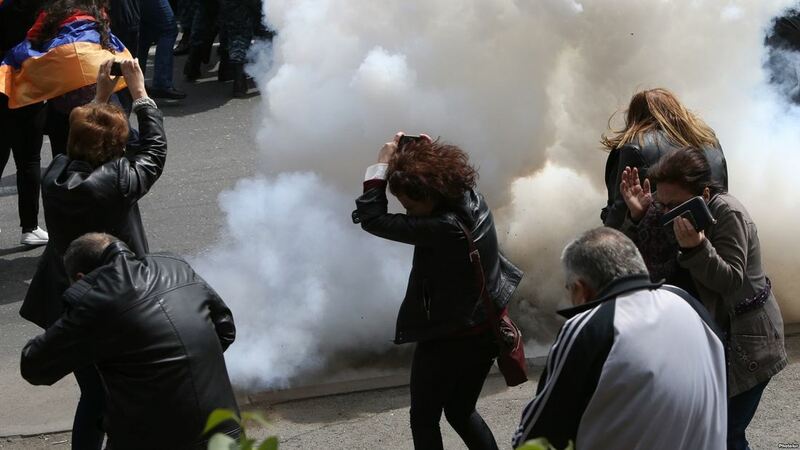 While Armenia’s National Assembly voted to elect Serzh Sargsyan as the country’s next prime minister, protesters continued to close off streets in downtown Yerevan and elsewhere. Today, on April 18, demonstrators continue their peaceful protest against the reproduction of Serzh Sargsyan's government. We, hereby, call on concerned citizens to go out to the streets and take part in peaceful marches and actions. Human Rights Education and Monitoring Center (EMC) organized second Queer Forum,Tbilisi, January 2018. The main aim of the Forum was to critically rethink existed political reality, controversial practices and forms, to analyze global and local perspectives and to trigger alternative thinking and creation of strategies of queer resistance through guided discussion. Beyond analysis of existed reality, Forum strived to create alternative leftist educational space and to encourage mobilization of groups for united struggle against oppressive structures. As mentioned above the Forum lasted three days. It started with the Presentation of The Volume by Tamta Mikeladze, Director of Equality Policy Programme, EMC. After her presentation there was a lecture about “The (Post) Socialist Politics of Sexuality”, which was held by Piro Rexhepi. Piro holds a PhD in Politics from University of Strathclyde and is currently a research fellow at the Max Planck Institute for the Study of Religious and Ethnic Diversity. The Forum was also full of Panel Discussions in total questions raised by Georgian activists. The next day was interesting for its diverse reports both by foreign lecturers and Georgian professionals. Johanna Oksala, who had her lecture at this time, spoke about “Feminist and Queer politics against Neoliberalism”. Joana is an Associate Professor of Environmental Philosophy at Pratt Institute. The last day of the Forum began with the Video Lecture. The theme of the lecture was “Fighting to Win: Resisting False Victories and Building a World We can Live in”. It was presented by one of the Associated professor at the State University School of Law Dean Spade. This was criticising both Obama’s and Trump's politics toward LGBTQI+ issues. Afterwards, Paola Bacchetta, who is a Professor from University of California, Berkeley, presented her topic on “No Compromises: Queer Alliances to Bring Down Planetary Coloniality, Capitalism and Misogyny”. The Forum was closed with Panel Discussion on the main topic of “Reinventing the Queer Left: need for alternative activist platforms and strategies”. In solidarity with our partners in Georgia the members of Women in Black, Armenia initiative Arpi Balyan and Lusine Kosakyan also took part in Queer Forum. They highlighted the importance of the Forum and outlined the need of such discussions in our region. They also got acquainted and built up a network with some of the speakers, who were very surprised and happy for the participation of the Armenian representatives in this Forum. On November 15 at the Center for Contemporary Experimental Art (ACCEA) took place an exhibition titled "I speak to you, you don't listen". This aimed to bring street art from street to a "museum" and also it had an attempt to make read and make listen to images, voices, which are not visible, are oblivious hidden because of some privileged agendas. The author of the exhibition is one of the members of our initiative Arpi Balyan, who cooperated with a young artist Haniel Cass while making graffiti sketches and templates. During her work Arpi mentioned that those graffities "have emerged on the walls of busy streets in faraway cities; they’ve emerged on such buildings which are both a reason of squeezing those sounds and an obstacle for those images’ visibility. Anyway, those images and voices have found a place in “museum” to be represented, to speak, to be spread (as fast as gossips), to show the danger from being disguised and to propose their own agenda". "The increasing militarization which gives privilege to masculinity for the sake of its own survival, silences such voices and images, humiliates the feminine or ignores the necessity or the right of its existence. For keeping its own privileged position militarization with the help of patriarchy creates a bunch of tools giving “natural” templates to women; stereotypes like “a good citizen”, “a hero’s mother”, “a pure daughter” and “a self-sacrificing sister” that are reproduced and approved through cis-men’s toasts, by any type of media, through our conversations and relationships. Apart from these, other identities are not “legal” because they can question the patriarchal system and be a threat for the continuity of militarization". During the exhibition you could hear the author's feminist and anti-militarist text via audio records. And in another corner of the exhibition you could watch a one minute film about "nameless" women statues which stands in the streets of some Armenian cities. The whole exhibition and the implementation of the idea won’t be happen if the author didn’t get the mini-grant, which was declared by Women resource Centre (WRCA). And it is also important to mention that the tolerant attitude of AACEA to such kind of agenda made it possible for the graffities to demonstrate its simplicity and freedom as it was on the streets. WIB Armenia Initiative held a capacity building in july 21-23, which may help the members of initiative to get more information about specifics of fundraising and program management. The first part of training, which was devoted to fundraising, was held by queer activist, feminist Anna Nikoghosyan. She introduced the meaning of project in general, spoke about the specifics we must take into consideration when choosing funds. She also gave us the whole description of project, which will help us to analyse our problems, goals, target group(s), our activities while writing our new project. project management, was realized by the expert Vahan Kostanyan. Vahan constructively introduced the whole structure of project management using some interactive methods of training and tasks, which helped us to be involve and focus in our needs and skills. This was a good opportunity to use this whole information while writhing our new project. Arusik Ohanyan, a member of “Women in Black, Armenia” PeaceBuilding Initiative, participated in a Regional ToT on No Hate Speech called “TURN HATE OFF” (14th -20th of May 2017, Georgia). Hate speech is a significant challenge to democratic values, such as tolerance, freedom of speech or the right to freely express oneself. In the region of Caucasus sexual and ethnic minorities, as well as individuals especially from the young generation, are constant targets of hate speech disseminated throughout the Internet, media and everyday life. The main purpose of the TOT course was to expand No Hate Speech movement and train No Hate Speech activists in the area of Caucasus. The participants were young trainers, Human Rights activists and young leaders, who were actively involved in their local youth organizations in Caucasus and already have some experience in human rights education and possess basic knowledge about hate speech as a phenomenon. The ToT aimed to educate the participants about values and ideas standing behind No Hate Speech Movement; to train and share the best practices about the useful tools of effectively combating and defuse hate speech; to support participants in developing their own projects on No Hate Speech; to assure a long term, sustainable increase in quality of partner organisations’ work with combating hate speech and human rights issues in the region.